Anticipation, n. The feeling of excitement, as if something is just about to happen. Used in a sentence:The business went under because there was no plan to build anticipation around the product. Note- It happens all the time. Building anticipation for your product is called Branding. Budding Entrepreneurs come in to buy advertising, when they have yet to divine their Branding. It is impossible to create effective advertising without Branding. Oh, you can try. But it is easier to roll down the window and throw your money out. It is such a common experience in the startup world to run out of cash right before the branding phase, that our company is launching an all-out guerilla war to stop entrepreneurs in their tracks and help them to reverse-engineer their game plan. My job is to help them think like a marketer. See the chart below? Advertising is the little red triangle at the top of the pyramid. Branding is everything else. Branding supports the advertising–not the other way around. Branding is not a nicety. It is not an extra thing you do after you start a business and once you get to a certain size. Branding is your entire relationship with the very person who keeps your lights on. Nice. Lights are really nice. If only entrepreneurs put as much time into creating customer anticipation as they spend crunching numbers! If only they stopped long enough to think about what their customer truly wants. They would not have to be just another pretty face in marketing land. They might find out that no one wants the product as they have planned to make it. They might find out–and in advance of production– that people would like the product much better if they tweaked this one little thing. They could avert the lethal blah blah blah marketing drone. They could spare the whole marketing department the suicidal thoughts that accompany the plastic world of stock photography. Alas, despite the alarming demise of small business, the great majority of entrepreneurs decide to work on Branding later. They end up looking like a cardboard box. If diamonds are a girl’s best friend, this is not the way you should present one. The whole experience is totally devoid of anticipation. Anything could be inside a cardboard box. If someone gave you this box, you might even decide to delay opening the package until after work. Even if you told me there was something valuable inside this box, I might not believe you. Because the verbal message is contradictory to the visual message. The packaging totally degrades the contents. I am not engaged. My opinion? Cardboard wrappers surround many languishing businesses. Their branding does not do justice to their product. I once worked with a business with a completely wonderful product. Despite my urging to revamp their marketing, they decided to stay on their old path. Their old school delivery only resonated with an old school audience. That old school audience died off. Literally. The company sold out, and their original investment lost much of its potential and future opportunity for another entrepreneur. Sad. Everything you do in business is branding. Every customer interaction expresses your brand. Many entrepreneurs market in pajamas. You would never go to a sales call in pajamas because no one would take you seriously. So why do your marketing in your pajamas? The great news is that you can craft the exact expectation you want your customer to have. How can you build the right anticipation?You can do it by design. It is not marketing mumbo jumbo. It is finding a way to tell a story, and to tell that story in an engaging way about your product and service. 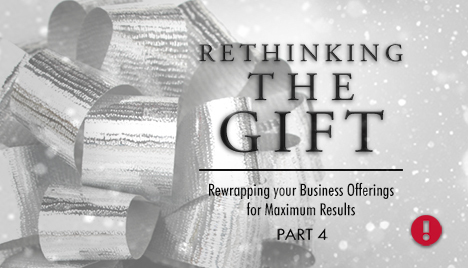 Last week we were thinking out loud about your product–thinking about it as if it were a gift. 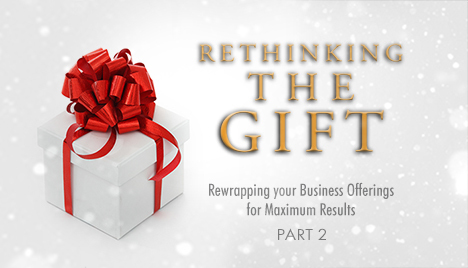 What if you were to upgrade the outside appearance of your business to match all that it really is inside the box? Does the wrapping fit the gift? With the help of a professional designer, you can figure out how to support the right message with the right visuals. Your marketing can create a sense of place, a sense of person, and plan for the customer’s anticipations. Your marketing department can empower the sales department, making their work ten times easier. Your marketing can return ten times higher yield, all because you have planned to engage the customer!!!! Engage. v., To occupy the attention or efforts of a person, to attract, to promise, or please. Used in a sentence: When every competitor is shouting for the customers attention, Branding is the only way to engage your customer. Branding creates the right wrapping for the right gift. Big box or little box, rethink the wrapping. Craft the customer’s anticipation and watch the value of your product climb higher and higher. After all, they keep the lights on for you. Read Part II- What Were You Born to Do? Why do we at etc!graphics inc, a graphic design company, care about your business strategies? Because no matter how beautiful we make your visuals, your graphics will never make more sense than the clarity of your own vision. The clearer your target, the more lucid your marketing will be, and the better connection you will create with your visual graphics. We want to help you become the best you can be. Join us all this month as we share ways to help your small business sustain and grow in a crowded marketplace. Etc!Graphics is devoted to helping you, the small business owner, think like a marketer. Rethinking Your Gift- What Were You Born To Do? Rethinking Your Gift: What Were You Born To Do? When I began writing this post, I was unaware I would be supplied with a living breathing illustration. Nor did I know that it would be someone near and dear to me providing the illustration. My message was blasted right back at me, and perhaps a bit too loud and clear, so timely that it is obvious that I need it as much as anyone. What were you born to do? Do it. Do it now. I was getting ready to go outside for a bit of exercise last evening after work before the sunset had stolen away all remaining traces of light. My phone rang. My husband had been working diligently on our new old house. He was stressed and out of breath. He had been diligently framing a wall and had just shot a 16D nail through his hand with a nail gun. In my past, such news has rendered me a complete hindrance––as in, someone please shove me out of the way. So I knew I had achieved new heights when rational questions came out of my mouth, rather than screaming violently into the phone. “Are you alone?” “Are you bleeding?” “Do you need an ambulance?” I asked these questions without shouting. I amazed myself. After clarifying the answers of yes, no, and no, it was determined that I was the best ride to the ER. It was your typical ER experience. My husband’s pain had not yet set in, so persons in labor, bleeding children, and anxious adults, (as demanded by the Hippocratic Oath), were allowed to cut in line. We spent most of our evening watching the parade. I suggested next time he needed a day off of work, to just to let me know. How does this illustrate my point? Some people know what they were born to do almost from the day they were born. My husband is one of those people. Though I was not there, I believe he was born with an Ebony pencil in his hand. He has been drawing since he was old enough to understand the concept. He was born to make art. I have often envied such people, who knew so clearly–and sometimes so early–what they were born to do. But struggling to find your sweet spot does not make it any less of a gift. For many, finding your sweet spot is a journey of many years, of marching forward to the next opportunity, and of working diligently to connect the dots to complete the picture. The point is to find your gift. Why did you go to work today? If your goal is to get money, you need a new goal. If your goal is to find out what you were born to do, the money will follow. It never works the other way around. To go to work for any other reason than to express your gift is to fall short of what you were put on earth to do. It is to short the whole of humanity of something we all need. You have something to give us, and without your gift, we will all be lacking. I just had a wake-up call. Why I have to be such a fickle person, and almost lose something of value to value it, is beyond me. But today I am thankful my husband can still do what he was born to do. This accident has made it clear, that he needs to make hay while the sun shines. He needs to make more art. As a marketer, I will never encourage you to go for the money. I will never ask you how you can make more money, get more followers, or get more likes. I will always ask you how you can make more art. Rethink your gift. What has God given you to do to benefit the rest of mankind? This is the right time to find it. Now is the time to make more art. Did you know that the level of clarity you have about your business internally is reflected externally? All this month we have been focusing on the Unique Value Proposition: finding something you can say about your business that no one else can say. 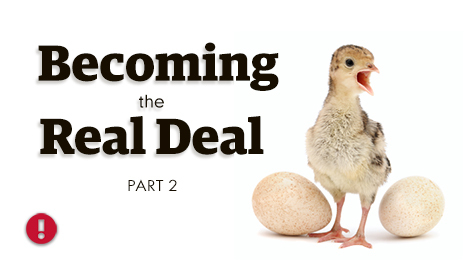 In Part II, we encouraged you to just say no to the wrong sales- so you will have time to develop the right sales. In Part III, we encouraged you to get your eyes off the competition and focus on what you do best. Doing the work to develop a Unique Value Proposition can help you find a whole new way of doing business. Once you are no longer using tired words, once you are no longer desperately seeking sales, and once you are no longer reacting to your competitors, you can be proactive instead. Once you know what you are not, you can decide who you are. You are then ready to clarify your own unique culture. You can create art. You can do business by design. Running a small business is an art form, and the visual art of your business will always reflect the level of clarity you have about your mission and vision in the world. Sound preposterous? Hardly. It has always been true. Through the centuries, art has always reflected the culture in which it is found, sometimes more accurately than the writers and philosophers of that same culture. Artists portray the experiences and the values of their own culture, unaware that they are doing it. They are truly in the frame. Your company graphics will also reflect your company culture. Yes, you are in the frame. Why not become aware? Why not make the picture reflect what you want to say? The design of your company includes your visual graphics, yes, but goes well beyond. Design is everything your business does and how it behaves. Your visual design reflects what your company believes and the way your company does business. It reflects the entire experience, from the inside out. It carries the story, provides context, and delivers meaning to your potential customer. The irony of it all is that it speaks the loudest, (and in a bad way), when the context is not there at all. It is said you cannot judge a book by its cover. I have to question this old adage. It certainly does not apply in business. People make instant decisions about whether to do business with a company by the cover alone. Your graphics tell the outside world what they can expect inside. Therefore you should have a reason and a why for every font, photo, element, and image you choose. Your graphics should be carefully crafted to fit within the context of your business story and culture. It should never be left to chance–or to your mother-in-law–to define. Sure, your logo and graphics cannot express everything. They are symbolic. But those symbols should be intuitive. They should inform and engage and encourage us to find out more. You may not buy into the idea that visual design is a necessity for running a small business. But if you want to grow, keep in mind, I know of no Fortune 500 companies that did not invest heavily in the design of the business itself, and the graphic design that represented it. Design is just how they do business. There exists a strong correlation between great design and success. The unique value proposition is one of the most effective tools in your marketing tool box. Uniqueness adds value to any work of art and makes imitation more difficult. Is the UVP easy to define? No. But it costs you nothing but time. It is time well spent as an investment in your own success. Your Brand is your culture. One cannot not communicate it–whatever it is. No communication is also communication. Take time to step outside the frame, and take a good look at what your Brand is saying, both with and without words. Doing business by design will transform your business into a work of art. 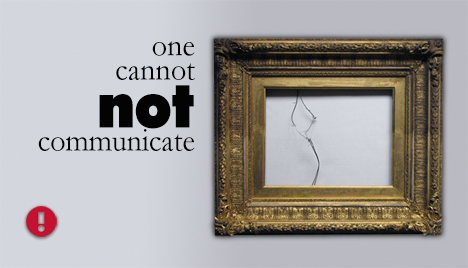 “One cannot not communicate” is a quote from Paul Watzlawick, a philosopher and communication theorist, 1921-2007. You can read about him here. For entrepreneurs, a good sense of marketing is prerequisite for survival, even if you do not know exactly how to do it. If you did not get that MBA before you began business, many of these kinds of skills are learn-as-you-go. After all, most entrepreneurs do not start business because they just can’t wait to get at the accounting. They start because they love to cook, or they love plants, or they love to cut hair–not because they want to learn the mechanics of business. If you are a chef, you just want to get your head down and create that culinary masterpiece on a plate. But even if you create it? Most entrepreneurs do not want to toot the horn, even if it is a masterpiece. They would rather other people to do it for them. We were taught not to brag, right? Unfortunately, “if you build it, they will come” as a business philosophy is a pipe dream. Even if you have the best gourmet hamburger in town, no one is obligated to come. You must give them a reason. Your friends, family, and neighbors will eventually tire of your gourmet hamburgers, and you will need to bring in new customers. And if you have not noticed, the hamburger industry is a crowded place. Many industries are crowded. Which brings me to my point: Competition is good for us. Right now, the Iowa State Fair is in full swing with concession stands every 15’ ready to sell you anything that will stay long enough on a stick to be consumed. Whether frozen, fluffed, or fried–there is something to satisfy your every fetish and craving. No one is counting calories at the Fair. No one cares if that two-bite treat costs $6.50 plus tax. Everyone has money in their pockets waiting to fly out to purchase the newest confectionary adventure. 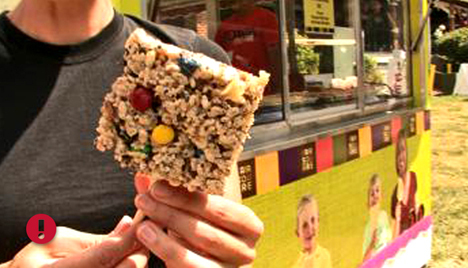 And let me tell you, if there is an ice cream bar to die for? I’m signing up to die. And there are thousands behind me. Much competition means much demand! Demand is a prerequisite to selling anything! Much competition draws more customers, because they find many choices in the same area. 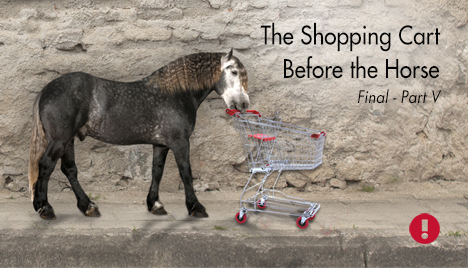 Someone is going to get the sale–might as well be you, right? Much competition demands that I become a better business person. To attract customers away from my competitor, I must make my product better. I cannot just make claims about it–I have to prove those claims, or the customer will not come back. I must out-serve, out-perform, and out-do my competition in customer service. I must be better than I was yesterday, and find new things to sell tomorrow. To make a profit, I must make my business work like a finely-oiled machine. It makes me be a better me. Much competition means the door is wide open for opportunity. All you need in such a case is better marketing. All this month we have been talking about the Unique Value Proposition. A Unique Value Proposition is something that you can say about your business that your competitor cannot say. Easy? Not on your life. Thinking about it can blow your mind. But thinking about it will also make your product blow my mind! It forces you to do market research–to find the gap in your competitor’s offerings, and to create your own niche. It forces you to do business in a whole new way. More important that anything, much competition forces you to know your customer–the best marketing strategy ever. “Haven’t small businesses failed because of too much competition?”, you might ask. Perhaps. But probably not. More businesses fail because they have not done the research to find out what the customer really wants. Why not focus on what you do best, rather than turning around to see where your competitor is at in the race? Focusing on others in the race makes you trip. It makes you a follower, not a leader. Get your head down, and work on making your customer happy. Focus on being the best business you can be, and you will find yourself in the lead. etc!graphics exists to help your business develop its own Visual Voice. We help you design your Brand into a visual language. But what if you do not have a strong Brand? If you do not know what your brand stands for, it will be difficult to craft a clear visual language to match. We want to help. Stay tuned all this month for Parts IV of Your Message, Loud & Clear. You can read Part I here, Part II here.